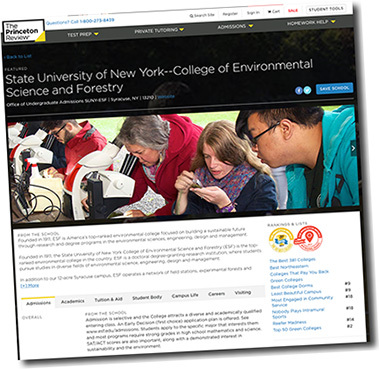 The SUNY College of Environmental Science and Forestry (ESF) is No. 2 among the nation's "green colleges," according to The Princeton Review. The college received the designation early this month when The Princeton Review published the 2016 edition of its book, The Princeton Review Guide to 361 Green Colleges. It is the second such ranking ESF has received in a month. In September, the college was ranked No. 2 on Sierra Magazine's "Cool Schools" list for 2016. The schools on that list were described as "working hardest to protect the planet." The Princeton Review chose the schools for this seventh annual edition of its "green guide" based on data from the company's 2015-16 survey of hundreds of four-year colleges concerning the schools' commitments to the environment and sustainability. The new "Top 50 Green Colleges" ranking list was tallied using data from The Princeton Review's institutional survey and its surveys of students at the 361 colleges in the book. "We are proud of these 'green' achievements, including our jump from No. 33 last year to No. 2 this year with The Princeton Review," said ESF President Quentin Wheeler. "But our work with sustainability and greening our campus is not finished. We will continue to develop and implement ways for ESF to be more sustainable. We will make continual improvements in all areas of campus sustainability, evaluate progress annually and share best practices with other colleges and universities through numerous networks. Our Sustainability Committee is presently working to identify and incorporate more sustainable practices into ESF's operations." "Perhaps most importantly," Wheeler added, "our impressive 'green' achievements were made possible through the dedicated efforts of many individuals over several years. This didn't happen over night." "We strongly recommend ESF and the other fine colleges in this guide to the many environmentally-minded students who seek to study and live at green colleges," said The Princeton Review's Robert Franek, senior vice president and publisher. Franek noted the growing interest the company has seen among college-bound students in green colleges. "Among more than 10,000 teens and parents who participated in our 2016 College Hopes & Worries Survey, 61 percent told us that having information about a school's commitment to the environment would influence their decision to apply to or attend the college." The profiles in The Princeton Review's Guide to 361 Green Colleges provide information about each school's admission requirements, cost and financial aid, and student body stats. They also include "Green Facts" about the schools with details on the availability of transportation alternatives at the schools and the percentage of the schools' food budgets spent on local/organic food. How Schools Were Chosen for the Guide: The Princeton Review chose the colleges based on "Green Rating" scores (from 60 to 99) that the company tallied in summer 2016 for 640 colleges using data from its 2015-16 survey of school administrators. The survey asked them to report on their school's sustainability-related policies, practices, and programs. More than 25 data points were weighted in the assessment. Schools with Green Rating scores of 80 or higher made it into this guide. Most of the schools (350) in this edition are in the United States. Ten are in Canada. One is in Egypt. How the Top 50 Green Colleges List Was Done: The Princeton Review developed the ranking list using data from its institutional survey for its Green Rating and its surveys of students attending the colleges. Ten data points from the institutional survey were factored into the assessment. Data from the student survey included student ratings of how sustainability issues influenced their education and life on campus; adminis­tration and student support for environmental awareness and conservation efforts; and the visibility and impact of student environmental groups.